Presently Associate Professor in the Department of Konkani, Government of Goa, where she has been teaching since 1992, Dr. Madhavi Sardesai has several articles and essays, published in journals and magazines, to her credit. Her book, Bhaasaabhaas (1993), which was an introduction to linguistics in Konkani, was awarded the Konkani Bhasha Mandal N. D. Naik award. She has also published Manthan (2012), a collection of research articles, and has three translated books to her credit, among them Eka Vicharachi Jiveet Katha (1993), which won her the National Sahitya Akademi Translation Prize, and Mankullo Raj Kunvor, a translation of the children’s novelette The Little Prince, from French into Konkani. She has also edited two books of essays by the noted Konkani writer and Jnanpith Award winner, Ravindra Kelekar. Dr. Sardesai has an M.A. in Linguistics, and presented worked on ‘Some Aspects of Konkani Grammar (Morphology)’ for her M.Phil degree. 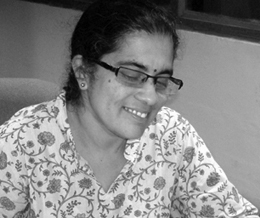 Her doctoral dissertation, completed in 2006, is on the topic of “a comparative linguistic and cultural study of lexical influences on Konkani”. She has been the editor of the Konkani monthly Jaag since Aug 2007, having been its executive editor for a couple of years before that. Dr. Sardesai has edited the Goa State Volume of the recently-announced Peoples’ Linguistic Survey of India.